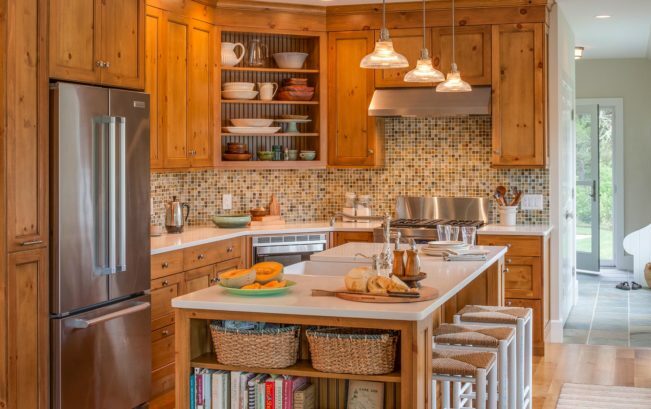 Appearing in the May issue of Cape Cod Magazine is a home that uses knotty pine, which not only speaks the same language as the wooded pond setting, but also represents family and the past to the clients, writes Laurel Kornhiser. In the kitchen, gold, cream and coffee tones are used in the backsplash’s one-inch tiles. Even though this kitchen faces east, the home’s open concept allows light to overflow from other rooms, making it welcoming at any time of day.